Cockayne syndrome is a rare genetic disease that presents with growth retardation, premature aging, retinal and generalized neurologic abnormalities. The presented case is a 29-year-old male patient, who was previously diagnosed as having Cockayne syndrome and who was admitted to the physical medicine and rehabilitation outpatient clinic with loss of strength in the right upper and lower extremity. The patient was detected to have acute-onset, non-traumatic rightsided muscle weakness secondary to acute subdural hematoma diagnosed in cranial computed tomography imaging at admission to emergency care department 8 months ago. When the patient was evaluated by us, he had a chronic stage subdural hematoma. Chronic subdural hematoma is a disease of elderly and aging is a well-known risk factor. 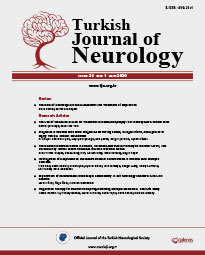 Our case demonstrates that the disease of old age, chronic spontaneous subdural hematoma, can be seen in a very young age secondary to premature aging syndrome known as Cockayne syndrome.